There are political movies, and there are political movies done by Oliver Stone. A man so unapologetic about his politics, he is for the fictional film what Michael Moore is for the documentary. He aims not to provoke, but to convince. Over the years, he has become the maker of subtle, brilliant excercises of filmmaking technique (the original Wall Street) to someone merely out to give a speech on an issue. In his follow-up to his infamous cautionary broker’s tale, we can see the two Stones perfectly. Gordon Gekko, perhaps his most famous and endearing character, is back and Michael Douglas plays him with the same tenacious, irresistible villainy. However, we see high school speech writer Stone, the man who made the two hour Saturday Night Live sketch W. a couple years ago, emerge when he has this larger-than-life character turn momentarily on his philosophy and give an actual lecture in a bare, undecorated hall. These combating philosophies take so much control over this sequel that none of the bare-bones plot really matters. Oliver Stone attempts to emerge us in the stock market collapse from 2008, and he does succeed in placing us there. The atmosphere, generated by his terrific cast and a beautifully photographed New York City, is one of the best actor/set fusions in recent memory. However, he gets overly-ambitious with his scope. A narrowed focus, perhaps just showing us one or two financial blunders and a few less double-crosses would’ve gone down better. When Gekko gets out of prison after serving 8 years for the insider trading he committed in the first film, he seems at first to be a changed man. His nature is the same, offering trades and exchanges for everything like a true Wall Street slick, but this time he’s after information about his daughter from her fiance Jake Moore (Shia LaBeouf). Jake, like Charlie Sheen’s protagonist before him, is a young broker with the taste and lust for a big financial score. As chaos takes over when the markets start crashing, the young protagonist’s life gets better and better, until it too goes into free-fall. He’s out for more than money when he infiltrates the agency of Bretton James (Josh Brolin). James, who Brolin plays with evil relish, perpetuated the rumors that led to Jake’s adoptive father’s (Frank Langella) business collapsing and to the man’s suicide. Jake wants to financially ruin James, as does Gekko, who was crossed over by him and sent to jail those years ago. The plot could be endlessly mapped out for paragraphs, but as I said, it’s not too important. Stone uses this lackluster and sometimes-dull narrative momentum to propel his characters up on the soap-box. There are genuine moments of emotion, like when Jake stares across their long apartment at his fiance after his father dies. His face crumbles, as does hers. Small moments like these keep Money Never Sleeps from putting the audience to bed, and they are all due to the cast. Douglas is again terrific as Gekko, even if Stone tries to change him. It is a huge irony that a staunch leftist like Stone created one of the right’s most heroic film slogans in “Greed is good.” You can’t help but wonder if he’s trying to backtrack here by giving Gordon the illusion of a conscience for a while. LaBeouf is excellent in the lead role, just as good as Charlie Sheen was in the original. He plows through the material and creates a convincing main character in Jake. His fiance, who also happens to be Gordon’s daughter, is played with skill by Carey Mulligan, but it’s mostly a one-note gig. Frank Langella is terrific in his 15-minute appearance as Jake’s adoptive father. If only him and Gekko had clashed on-screen together, it may have been a clash of the father-figures for the ages. 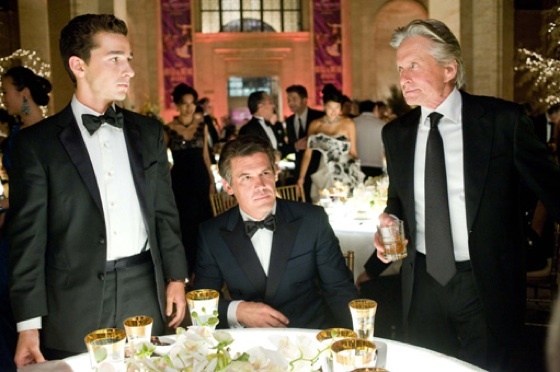 Instead with get Brolin as Bretton James, a new-age version of the Wall Street slime ball. In an entertaining confrontation at a charity fundraiser, the old and new schools of greed go at it. “Stop telling people lies about me, and I’ll stop telling them the truth about you,” Gekko tells him. These quick one-liners delivered by the cast raise this sequel above its formula and failed political intentions. The old school/new school battle should’ve taken place more on-camera than off. Stone decries the opposition better when he doesn’t shove it in the audience face. The gleaming shots of high society sprinkled throughout don’t help. Wall Street: Money Never Sleeps is a sequel that was born out of the real-world crisis it decries. Some things are better left to rest. This entry was posted in Reviews and tagged Carey Mulligan, Fall 2010 movies, Frank Langella, Josh Brolin, Oliver Stone, Political films, Sequels and Remakes, Shia LaBeouf, Stock market crash, Wall Street 2, Wall Street: Money Never Sleeps by matterspamer. Bookmark the permalink.